The use of anabolic steroids to interrupt the estrus cycle of female racing greyhounds is a common practice in the greyhound industry. As trainer James “Barney” O’Donnell said in a 2014 interview, “We use testosterone on our females, yes...We’ve been using it for years and years and years.” While not quite as headline-grabbing as greyhounds who test positive for cocaine, the industry practice of using steroids deserves equal attention for its impact on the health and well being of female racers. A female greyhound’s complete cycle lasts 15 weeks. According to Care of the Racing & Retired Greyhound, a female can only safely race three of these weeks if left untreated. So to avoid the loss of productive racing time, female greyhounds are routinely given anabolic steroids. But what effect does this continued exposure to steroids have on the health of the dogs? The industry will tell you none. It’s just like birth control they say, trying to equate the issue with human contraception. Besides, they argue, the dosages are so small as to be irrelevant to the health of the animal. However, when you look at the science of what happens when dogs are given these drugs you reach a different answer. 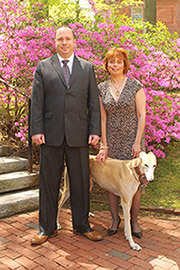 The Merck Veterinary Manual states, “[L]ongterm suppression of estrus by using androgens is not advised ... the safety and efficacy of injectable testosterone, as is practiced commonly in racing Greyhounds, has not been supported by controlled studies and is not advised.” According to the racing industry’s own handbook, Care of the Racing & Retired Greyhound, anabolic steroids can cause serious side effects including increased aggression and virilization. Steroid use has also been shown to have a negative effect on dogs’ heart functions, and some studies have even linked steroid use to liver, kidney and cartilage damage, gastrointestinal problems, and shock. In addition to these deleterious health effects, there is some evidence that steroids can affect performance. Dr. Richard Sams of the University of Florida Racing Laboratory, has said that anabolic steroids such as stanozolol would be “excellent” for enhancing greyhound race performance. Other countries have begun to recognize the dangers of anabolic steroids. In 2014, the Irish Greyhound Board outlawed all steroid use. In Australia, testosterone is considered an illegal substance and in New Zealand all forms of steroids have been banned. This is not the case in the United States. In the past month, Florida Senator Kevin Rader filed a bill that would formally legalize the use of anabolic steroids in racing greyhounds. Interestingly, Senator Dana Young has filed a bill that would do the exact opposite by outlawing the use of anabolic steroids altogether. Consequently, from a Florida legislative viewpoint the issue remains up for debate. 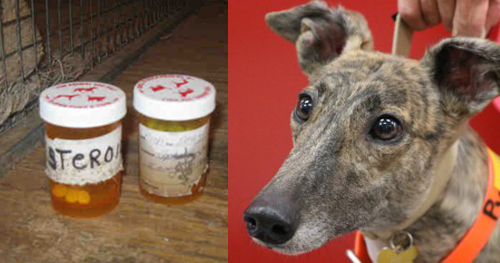 The greyhound industry knows that anabolic steroids are potentially harmful but uses them anyway. This can be seen most clearly in a recently adopted rule by the Association of Racing Commissioners International, an industry group which writes model rules for the American horse and greyhound industries. Anabolic steroids have always been classified as Class 3 illegal drugs according to ARCI’s Uniform Classification Guidelines for Foreign Substances. While they are still classified as such, ARCI rule 018-020 (16), which was quietly added on December 8, 2017, states, “Any usage of anabolic steroids involving racing greyhounds is prohibited, except that the administration of oral, or as otherwise prescribed by a licensed veterinarian, testosterone shall be permitted for the control of estrus in female racing greyhounds provided it is validly prescribed and properly labeled.” Only the greyhound industry would be so bold to both prohibit and allow a serious narcotic in the same set of guidelines. The duplicity of the ARCI Guideline is symptomatic of the priorities of the greyhound racing industry; an industry that puts profits above all else. As long as greyhound racing continues, those who participate in it will try to cheat the system.